The Snapdragon 820 carries the huge responsibility to restore Qualcomm's leading-position in high-end mobile chipsets, undermined by the unfortunate Snapdragon 810. Judging by the results preliminary development units show, it may very well be capable of doing so. 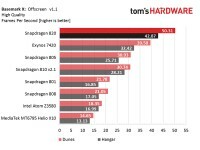 Over at the company’s headquarters working devices (non-commercial, naturally) were subjected to a battery of popular benchmarks and here are the findings. For starters, single-core performance of the new custom Kryo cores, measured in GeekBench, is well ahead of anything in the Android realm. 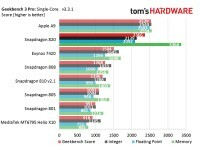 A near 60% improvement over Samsung’s Exynos 7420 in this respect, a score upwards of 2,300 points is still behind Apple’s single Twister core’s result. Multi-core results in the same benchmark show the Snapdragon 820 inching ahead of Samsung’s current-gen flagship silicon, but we’re yet to see what the Exynos 8890 is capable of. Still, in this test, 4xKryo is comfortably ahead of 2xTwister. The new Adreno 530, which according to the scarce information available on the matter appears to be an Andreno 430 with a few evolutionary tweaks, is actually mightily impressive. 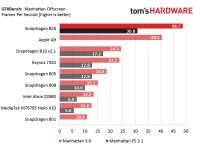 In the offscreen Manhattan test of GFXBench, which is run at a standardized 1080p resolution, the chip is capable of twice the frame rate of the S810 or the Exynos 7420. It also beats Apple’s A9 by some 20%. In the onscreen tests, where the test device has to push more pixels (2,560x1,600 resolution of the developer’s rig, versus 2,560x1,440 or even 1080p displays in the rest of the devices), the chip delivers respectable performance. Most impressive is the comparison with the Exynos 7420 here, where Qualcomm’s solution manages almost twice as many frames per second. 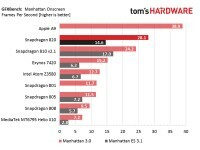 The overall score in Basemark X shows the S820 as a clear favorite as well, though the A9 is missing from the chart. And back to our headline Antutu result. 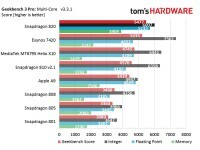 At 131648 points, the score is about twice as high as current-gen flagships from Samsung camp, rocking the Exynos 7420. 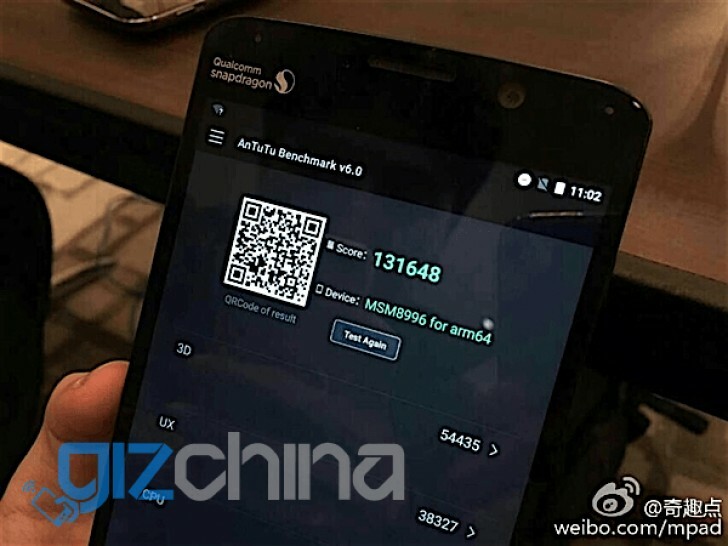 That makes us more than a little suspicious of its authenticity, but it is a photo of the developer unit with the Antutu score, and that can’t be doctored, right?